The Buddha is seated on a throne, his right hand in the upadesa mudra and an umbrella high above his head. An “ushnisha” (flame of knowledge) is prominent on his head and the creepers around the umbrella signify the Bodhi tree. Around the Buddha, in the outer row, is a full “orchestra” — several men are playing the lute and other stringed instruments, a couple of them are playing percussion instruments like the “mridangam” and there is also a “rasika” with his hand stretched out and enjoying the music. In the inner circle are two “ganas,” four devotees, two of whom are standing and two kneeling, all with folded hands, and a pair of prancing Yalis. Four more devotees (not seen in the picture), each kneeling in a corner, bear on their shoulders the throne. This masterpiece was among the 42 stunning Buddha bronzes and three Buddha artefacts in stone on display for the first time at the Government Museum, Egmore, Chennai, on December 21 and 22. T. Ramalingam, a farmer and son of Thambusamy Padayachi, found this priceless treasure-trove in 2004 when labourers were digging his plot to lay the foundation for his house at South Street, Sellur village, Kodavasal taluq, Tiruvarur district, Tamil Nadu. They are all datable to the 11 century C.E. to 13 century C.E. and belong to the Chola period. The 45 artefacts form an impressive addition to the Nagapattinam Collection of 350 Buddha bronzes, which were discovered between 1856 and the 1930s at Vellipalayam and Nanayakkara Street in Nagapattinam, where Buddhism thrived in Tamil Nadu. The Sellur artefacts range in height from 7 cm to about 52 cm. The collection includes three Maitreya figurines. Highly ornamented, the right hand in all the three is in the “abhaya mudra” and the left holds a “naga pushpa.” There are Lokesvara and Avalokitesvaras as well. (Avalokitesvara, also called Lokesvara, is a Bodhisattva — one who has nearly attained Buddhahood but prefers to serve the public, embodying the compassion of the Buddha. Maitreya is the Buddha who will appear in the world in the future). The Buddhas in stone include those in white marble and slate stone. There is a Buddha in metal, with an inscription in Tamil on the pedestal, datable to the Chola period. The script has not been read yet. The 45 artefacts were till now in the Kodavasal taluq office. S.S. Jawahar, Commissioner of Museums, Tamil Nadu, initiated the steps to bring them to Chennai and display them to the public. 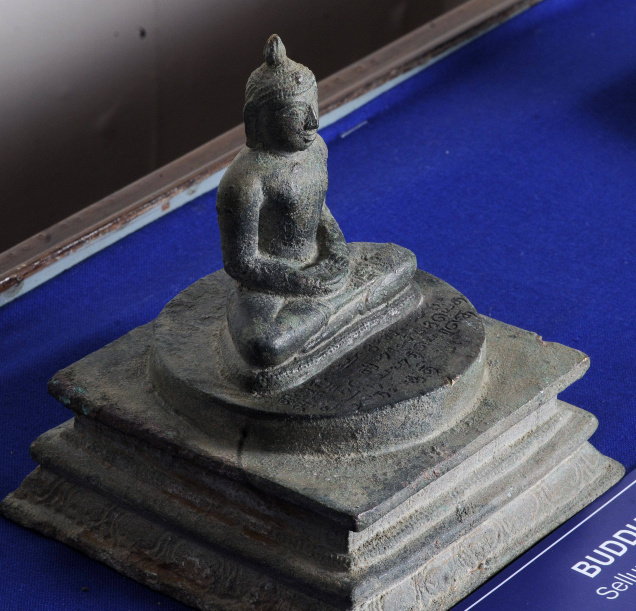 “The exhibition was organised so that people will come to know what a wonderful collection of Buddha bronzes Tamil Nadu has,” R. Balasubramanian, Curator (archaeology), Government Museum, Chennai, said. 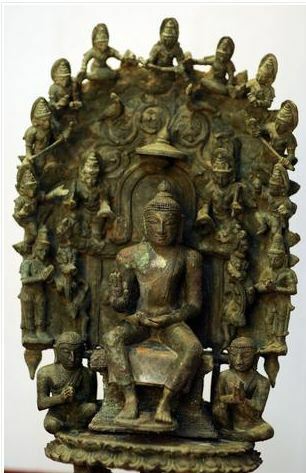 R. Nagaswamy, reputed iconographer and former Director, Tamil Nadu Archaeology Department, said the seated Buddha with musicians, followers and yalis around him was “an interesting and a very important find.” The entire Sellur Collection belonged to Mahayana Buddhism, which believed in worshipping the Buddha in form and portrayed Avalokitesvara, Lokesvara, Maitreya and others, and used more of Sanskrit, Dr. Nagaswamy explained. Another bronze of extraordinary workmanship found in the Sellur collection is a votive stupa, about 30 cm tall. On the base of the stupa, around the four sides, are tales from the Buddha's life. On the one side is Nalagiri, the mad elephant kneeling before the Buddha on hearing his voice, and the Buddha calming it with his hand. On another side is the Buddha preaching his very first sermon, after his Enlightenment, in the Deer Park of Isipatana, now called Sarnath, near Varanasi. Below him is a Dharma Chakra, flanked by two deer and followers with folded hands. Below this panel is a standing Buddha, with an attendant holding a parasol with a tall stem above the Buddha's head. On another side is the Buddha in Maha Parinirvana, that is after his death. On the fourth side is a seated Buddha, with his right hand in “bhoomi sparisa” mudra. On top of this base is the circular “anda” and above it is the “harmika” or the tiered vimana.Lift the anda and the harmika and, lo and behold, there emerges a tiny seated Buddha. Mr. Balsubramanian called it “a rare votive stupa.” Its style and the Jataka tales sculpted on its sides had a “close affinity to the Maha Chaitya” found at Amaravathy, near Guntur, Andhra Pradesh. “Perhaps, the Chola craftsman had visited Amaravathy before he did his piece in metal,” he surmised. This votive stupa was another “clear-cut demonstration” that the Sellur collection belonged to Mahayana Buddhism, Dr. Nagaswamy said. “The Sellur discoveries are definitely important and they increase our knowledge of Buddhism in Tamil Nadu,” Dr. Nagaswamy said.